The freedom struggle was gathering momentum, and Mr. Salve, who was an Indian Christian, joined Mahatma Gandhi. The Christian community was enraged and threw him out. But he was undaunted and sacrificed everything for the freedom of his country – renouncing his title of ‘Rao-Sahib’, burning all his suits and taking to spinning khadi. The British imprisoned him and his wife several times. 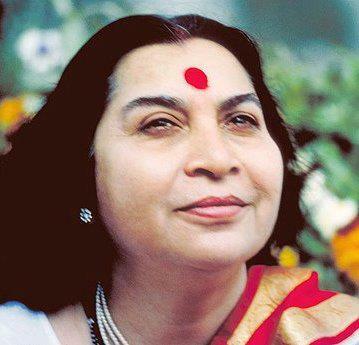 In the absence of her parents, Shri Mataji bore the main domestic responsibility of raising the family. Each family member had only two sets of clothes and slept on thin floor mats. Shri Mataji had only one coat throughout her education but she never grudged or grumbled. She was very happy that everything was sacrificed for the country. In fact she was very proud of it. She was only seven when the Christian Missionary School expelled her due to her father’s anti-British agitation. As her father was in jail, Gandhi took her under his wings. Shri Mataji later would praise Gandhi for establishing the base for dharma, inner religion or righteousness, in his country. He encouraged people to explore the Bible, to understand the Bhagavad Gita, to know all the great scriptures and great people of the world, and to understand them in an integrated way. When the time came for higher education, Nirmala chose to study the field of medicine focusing on the scientific terminology of the anatomy, and human physiology. She wanted to know how far human knowledge had gone. In 1942 she spearheaded the student freedom movement. Many young people gave up their studies to join the freedom movement along with her. It was not easy. Thousands of patriots sacrificed their lives. She was jailed several times, put on ice, and tortured brutally, but it could not break her indomitable spirit. She did not care for her life and was proud to sacrifice it for her Motherland. On 14th August 1947 India received her independence. Before Shri Mataji could finish her medical studies, she married Mr. Chandika Prasad Srivastava, on the 7th of April 1947. Although her husband was a prominent member of Indian Administration Service, his career took a sudden ascent as he became the Secretary to the then Prime Minister of India, Lal Bahadur Shastri. After Her marriage, Shri Mataji devoted Herself to Her family. They had two lovely daughters, Kalpana and Sadhana. When Her daughters were both married Shri Mataji’s concern for the well-being of society manifested in Her launching ‘Youth Society’ for films to promote healthy entertainment and protect the innocence of Indian films.